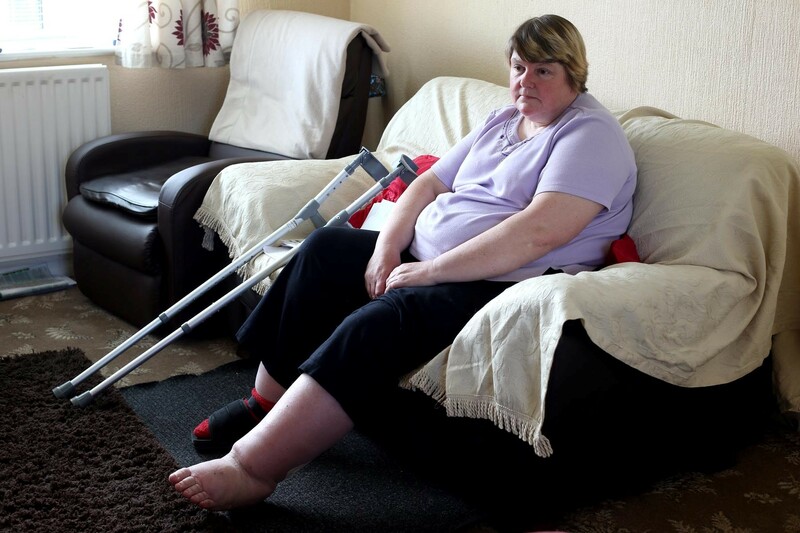 HOUSE BOUND: Pamela Johnson, of Ferryhill, who has been told that she is fit for work. 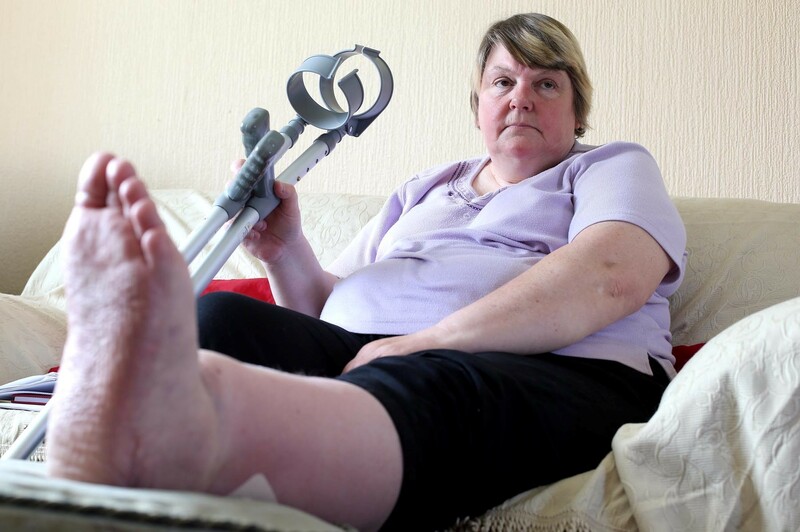 1) A WOMAN left on crutches by a leg operation has complained that she has no money as Jobcentre staff say she is fit to work. 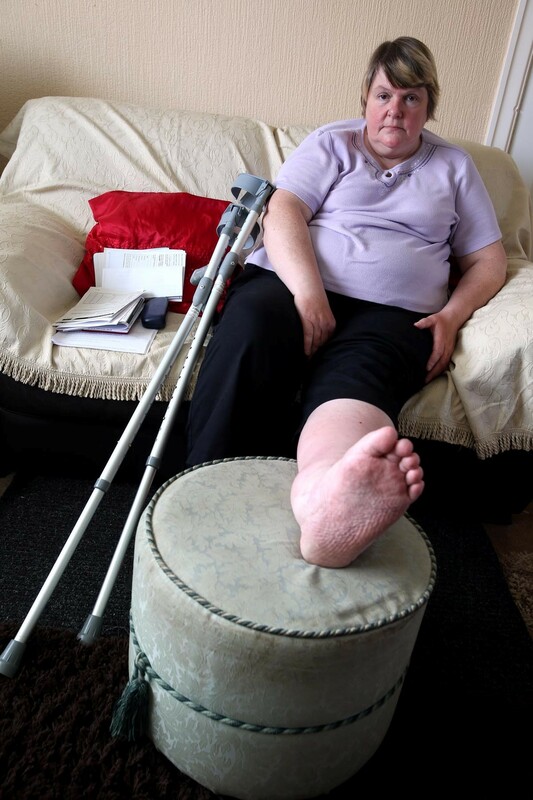 Pamela Johnson, 56, of Broomside, in Ferryhill, underwent an operation last October which left her unable to carry on working in a fish and chip shop. Miss Johnson began claimed benefits and said that Jobcentre bosses have now told her to sign on at Spennymoor to claim £57 Jobseekers’ Allowance each fortnight. She is also angry that the staff in Spennymoor Jobcentre deemed her to be fit to work. She said: “I had a medical and the Department for Works and Pensions (DWP) said that my money would stop from June 16 as I am capable of work. “I now have to go every fortnight to sign on or I get no money. If it’s raining though I can’t go out on my crutches as it’s slippery. A DWP spokesman said that clients could ask for the decision to be reconsidered or an appeal could be lodged. She said: “If we are made aware, in advance, of a legitimate reason why someone cannot attend an appointment we can look to rearrange it for a more suitable time. Iraq war veteran James Squires with his mum Louise. 2)An Iraq war veteran has enough to cope with since leaving the Army suffering from post traumatic distress syndrome. But James Squires was also having to live on just £300 a month because the Department of Work and Pensions was refusing to pay his Employment Support Allowance. His mother Louise, who is James’ appointee, sent in all the evidence she was requested to give but was told her son couldn’t have the £2,500 in a holding account. And neither could he have the £77 a week he was entitled to in the future. Louise, of Shiregreen, said: “James was receiving Job Seekers Allowance but was told to change this to Employment Support Allowance. “He hasn’t been paid since October. “I rang them and they said they have £2,500 in a holding account, but without a letter they couldn’t pay October to January’s money. “I sent them all the details they asked for and they wouldn’t even pay January to May’s money. They just will not sort it out. They are not accepting the evidence. “He has been treated abysmally. He is living on £300 a month disability allowance and has a mortgage to pay. Within several days of The Star contacting the DWP, James received £1,149 into his bank account to cover January to May payments. Louise said: “Thank you, it’s brilliant. We really appreciate your help. This entry was posted in Uncategorized and tagged dwp, ESA, PTSD. Bookmark the permalink. I have emailed you about an hour ago. Sometimes my emails don’t get delivered or, strangely, arrive late (as did yours this morning). So if you haven’t heard, if you put another reply on this, I will reply here. Then you can delete instead of post. No sign of it yet prayerwarriorpsychicnot ! Funnily enough my e mails seem to be on a go slow today too; a friend e mailed me at about 10am and I,ve only just received it … in fact she rang me because I hadn’t replied because she thought I was lying at the foot of the stairs with a broken neck! Happens to me all the time as a Targeted Individual. I can’t get or receive the simplest communications without things going missing, delayed, not received. Etcetera. OK put this up if you wish. I just thought it might be better to privately discuss first. The lady needs a mobility scooter. But if she lives on the tenth floor it would not be much use to her. If suitable I will give £3k towards it. Perhaps the newspaper might be able to help. Perhaps you have some ideas? What a generous and thoughtful thing to suggest. Cheers, Glynnis. I will try and contact the newspaper. I agree Jaypot; maybe we should retweet stories like this to get them to trend on twitter…would that get media attention d’ya think? I always say, Gods not sleeping, so the people who’ve been wronged will be righted and the others …. well watch this space!